Need low voltage cable to run your network in your home or office? Whether Industrial or Residential, we can run it. 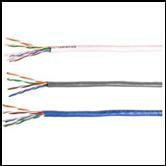 We have certified BICSI cable installers that are able to troubleshoot and install CAT 5, and CAT 6 cable.